There is simply no other way out there to transform a carpeted staircase easier than Retro Stair Treads. Retro stair treads make it easy for homeowners to transform a carpeted staircase into a beautiful new wooden staircase without the extra mess and expense of removing the old stair treads or staircase. Retro stair treads are "tread caps" that install over an existing stair where the bullnose has been trimmed flush with the riser below it. Stair-Treads.com is a pioneer and has been instrumental in the development of the retro stair tread. We've perfected the manufacturing process and offer both prefinished and unfinished retro stair treads in more than 25 different species and a number of popular stain colors. 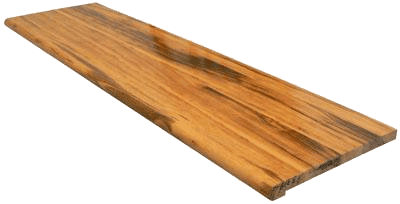 Our retro stair treads are made from solid select grade wood - no thin veneers on our product and you can rest assured that we offer only the finest selection of stair treads found anywhere! Our friendly and knowledgeable team members are available to assist you along every step of your remodeling process. If you have any questions about retro stair treads, using retro treads to remodel your staircase, or any of our other products, please contact us today and we will be happy to help you. What's the difference between left, right, and double returns?